Gatherings of people, especially involving woman, invariably end up in conversations about who lost or gained weight and what diet or exercise program is being followed.When you’re working towards a body positive approach to life, or recovering from an eating disorder, this can create quite a challenge. 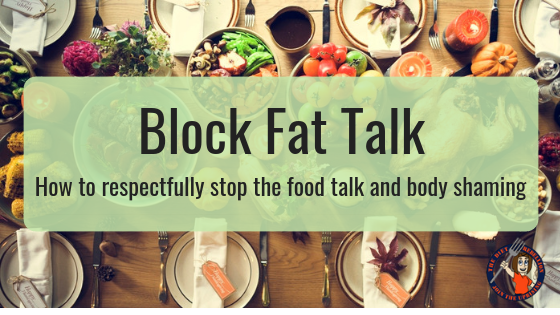 How do you respectfully, yet firmly, direct the conversation away from body and food? Here’s a few steps that you can take to make this family feast more enjoyable and respectful. Consider speaking to them ahead of time and let them know what you’re working on and that your food choices your body are simply not up for discussion. When you are changing the dance steps, it’s only fair to give them a heads up. Otherwise they’re going to trip up. They will likely need reminding but hopefully this creates the awareness up front. You can even discuss what you can say to them when they go to a topic that’s not healthy for you. This step is scary for many and I get it. Just remember that most people are making the comments because they love you. By you letting them know that their way of expressing that love is misplaced and is actually hurting you, they have an opportunity to support you. Rehearse what you can say to a variety of comments ahead of time so that you aren’t searching for words in the moment, or end up engaging in a conversation that is not healthy for you. Below are some suggestions but try to use your own words whenever possible. These are not to engage or defend, just simply stating where the lines are. Visualizing how you’ll handle things will leave you more empowered. And don’t worry if it still comes out wrong. Self-compassion goes a long way. This is a whole new language. If the responses that you have prepared don’t shut it down the first time, repeat it again. • Repetition reinforces your stance without engaging in the conversation. I find three times is typically all that it takes. When repetition fails, try saying “This is not a conversation that I am willing to have today”. If you’d like the opportunity to discuss Body Positivity or Intuitive Eating with this person you could choose to add “If you would like to discuss this further at another time, we can set something up”. Again, if it continues use the “Rinse and Repeat” step again. It may be a good idea to have a code word with your partner/friend/child/ride that means “We’re leaving, NOW”. Giving yourself permission to walk away is important. If it gets to be too much, your health is more important than how it looks or what they’ll say when you’re gone. Consider having a place to go or something to do (like journalling, using a punching bag, yoga) afterwards so that you can decompress without using food or exercise. Finally, be respectful, even if they are not. You’ll want to speak with strength and grace so that you leave with your head held high. When you change the dance you challenge their ways. For some, that won’t be well received. Know that this is a reflection of who they are, not who you are. Here are a few suggestions on how to address specifics types of comments. Rinse and Repeat. Comments about what diet they are on or the food itself:”Can you believe how much sugar is in that? If you would like more support from women like you, please join us on Facebook.